Back more than two months ago, I promised the blog that there would be another post about projects and school. Then, for some reason, I stalled. It’s not that I didn’t think about it. I started this post a half dozen times, but I have really struggled to figure out what I wanted to say about this exactly. Here is what I know. I know that we’re going to leave formal curricula behind for content subjects to be more project based. That means math stays and if we decide we need to pick up grammar or logic or anything again, which we have done off and on, then we will, but goodbye to having history, geography, art, and science plans. We’ve always been loose and living book based with those, but we’re headed out into the sea without a rough map for at least a couple of years. Some of that will be more kid driven than learning we’ve done in the past, not so much because I didn’t believe in child-led learning before, but because I had two kids who were previously much less interested in engaging in it. I think having a bit of that rough map in their heads now has made them feel they can at least pick a general direction in which to head. I also know that pushing forward with some level of standards for learning is also important to me. It’s important to me that the kids keep practicing writing, keep practicing revising, and keep improving their organization. I know that while I want learning to be process oriented, I want it to have rules and boundaries. Life has rules and boundaries. I believe that “do whatever” is a dead end of a guideline for most people. People on the whole do better with challenges and the greatest creativity can come from having more rules, not less. So where this all leads me is that I want there to be a sense that some projects have to be revised and changed and remade sometimes to fit the rules. Not that every project must fit in a neat box or even be completed, but that some must. Stories must make sense, imaginary worlds must seem believable, science experiments must follow the scientific method, technology projects must have an end goal. One of my biggest inspirations in heading more into projects for school has been Partnership Writing from Brave Writer. It’s not so much more than suggestions for writing projects, most of which we’ve now completed. However, in implementing these, we’ve always taken several detours and side trips. The kids have had their own interpretations and we’ve had to negotiate the end products. It’s been mostly a positive experience for all of us and I’d like us to be focused around that sort of learning, with the kids slowly taking the reins more and more, over the next couple of years. I’ve blogged about some of our Partnership Writing projects in the past, such as the secret codes, the timeline, the homophones, and the mythology lapbooks. I’ll add here some images of the catalog sales project. This was a perfect example of how the kids took the project and really took charge of it. It was originally designed to be about an historical period, but Mushroom decided his catalog was going to be for many thousands of years in the future, when the sun was about to become a red giant and humans were fleeing to one of the moons of Saturn with the help of special portal technology. 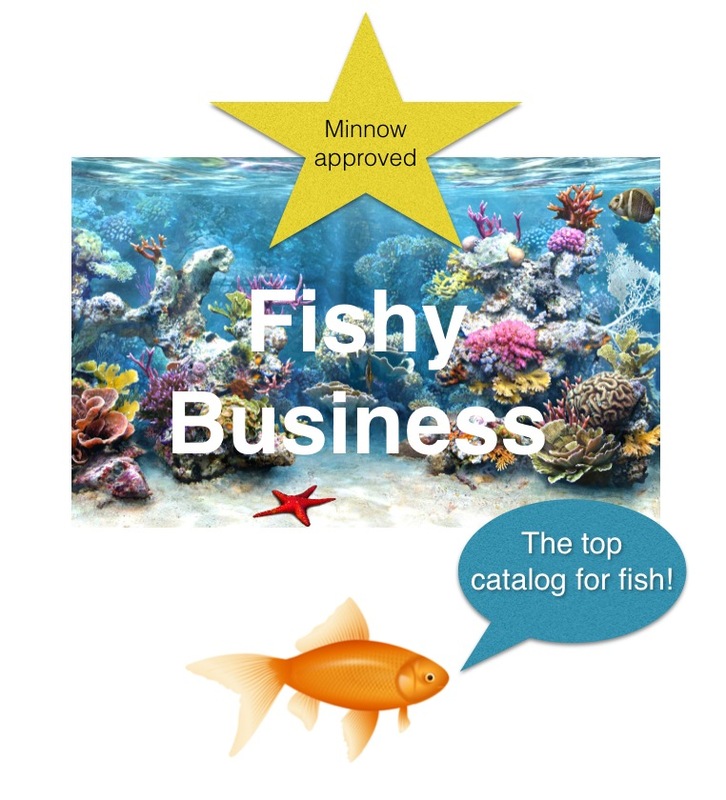 BalletBoy decided to do his catalog for an undersea world where fish apparently shop in catalogs. I was happy to accommodate these creative ideas. Where on Earth? 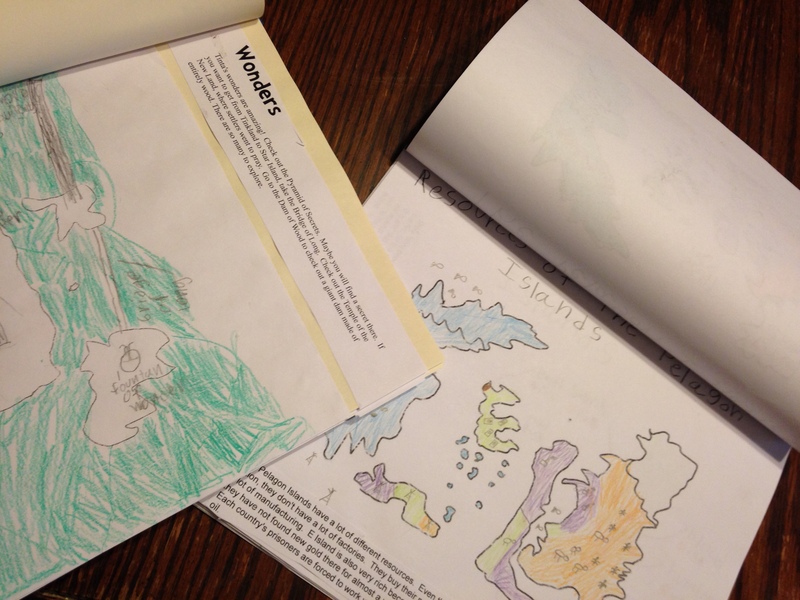 as inspiration for drawing maps of the imaginary island chains the kids invented. However, we repeatedly ran into trouble as the kids drew their maps. You can’t have average lifespan be 25, or, at least, not without an explanation. And you can’t have extremely rich areas woven in with extremely poor ones all over your island, at least, again, not without an explanation or a story to tell about why. It’s your imaginary world, but it has to make sense and tell a story. Getting to that story without feeling like I was just outright overruling them was incredibly tricky. This was by far the most difficult of the Partnership Writing projects. Not only was it a supersized one (the schedule allows for it to take an extra month) but it presented more thinking problems than any of the other projects. We encountered a lot of the same problems when we took on another project that wasn’t a Brave Writer one, this time focusing on math. We drew from the book Designing Playgrounds from the Math Projects Series in order to study playground design, then propose and design our own playgrounds. In the end, this was a really fun project. I liked the build up steps suggested in the book, in particular going to an actual playground and keeping track of what types of activities kids engaged in most often as well as using pattern blocks to think about space on a grid before actually doing any freehand drawings or designs. There was a lot of really great complex measuring involved in this project, as well as a lot of creativity. It was really perfect. Except that we struggled again when things needed to make sense. The final step of the project involved making models, but it was very difficult to understand that a tiny block was a pretty large piece of play equipment and BalletBoy in particular seemed to feel that building any element to scale was going to completely squelch his creativity. But if the models didn’t represent semi-accurate scale, then one of the goals of the project, since it was so focused on math, seemed to have gone out the window. I didn’t feel like letting that go was acceptable in this case. I got a very good suggestion for guiding the kids through this in the future, which was to think of it like writing and do more first drafts before making the final project. We did do a good bit of playing around, but more in two dimensions than with modeling, so I think we should have given more time for that. In the end, we all came to agreement and the final products looked really impressive. The kids wrote up project proposals as if they were the contractors submitting their bids and they made little drawings and wrote headlines for imaginary newspaper articles about the opening of their new playgrounds. As you can see above, BalletBoy’s featured a play village, a shallow water play area, and a large climbing feature inside a pretend mine. Mushroom’s, which is below, was focused on ziplines, a climbing feature, a sandpit in the center, and a huge maze which would have puzzles on the walls and multiple entrances.